The Gondola is a room inside the Secret Mine in Luigi's Mansion: Dark Moon. The Gondola is accessed by taking the north door inside the Terminal. This location is a small room with a machine that shoots burning coal. There are a few shovels and red crystals in here as well, indicating that the Gondola was a means of transportation at one point. The door on the south leads back into the Terminal. 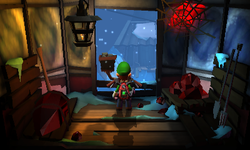 During Across the Chasm, Luigi must go to the Gondola to be able to access the Workshop. Once Luigi reaches the Gondola, a Strong Gobber, Strong Slammer, and Strong Greenie block it off with paranormal chains. After these ghosts are defeated, Luigi can use the machine inside of the Gondola to melt the various pieces of ice on the chain of the wire systen so he can progress. Only during Across the Chasm, Luigi can use the machine to make a tree fall down, creating a bridge inside of the High Wires. In this dimension, Luigi needs to fight fight three Hiders by throwing snowballs at them. If Luigi completes this task before time runs out, he obtains a sapphire. This page was last edited on August 28, 2018, at 01:33.